Do you dream of writing a book? Writing a book is a huge way to set yourself apart as an expert, to share your message on a broader scale, and attract clients to your business. The word “author” has the same root as “authority” for a reason. I believe if you’re feeling prompted to write, sharing that book inside you is one of the reasons you’re on this planet. Writing this book was more challenging and rewarding than my master’s thesis, which I wrote during maternity leave and I thought would kill me! So yeah, this 300-page baby means a whole lot to me. In summer 2016 I was commissioned to write a biography for Alan E. Hall. He’s well-known in northern Utah and beyond as serial entrepreneur, angel investor, and philanthropist. He has influenced thousands and thousands of people around the world as a caring employer, generous philanthropist, and inspiring leader. We spent a year and a half meeting regularly for interviews for the book. There’s something sacred about hearing someone’s life stories like that. I got to know about the kid, teenager, young adult, and mature versions of Alan through his memories. And what I loved most of all was how he’s dedicated his life to GIVING BACK after finding his own business success. His lessons have become intertwined into how I view the world, family, business, philanthropy, and most of all, myself. I’ll share some of those insights in another post, but for now, here are five tips to help YOU write your own book. 1. BE PREPARED FOR SERIOUS MENTAL BLOCKS. Any time you do anything important, you will have an internal struggle. It’s so much easier NOT to finish something hard. To tune out deadlines and binge on Netflix. To fill your life so full of commitments there is no room for creativity. For me, this internal struggle was painful. I fought with self-doubt, procrastination, and self-sabotage I couldn’t really understand. Thankfully, I read Stephen Pressfield’s landmark book, “The War of Art” during this project. I cannot recommend it more highly. Pressfield so eloquently identified my daily battles with inner Resistance—and then gave me tools to fight it. Some days Resistance won the battle. But I won the war. The hardest part of writing a book was NOT the writing. It was forcing myself to focus. To carve out uninterrupted chunks of time where I could lose myself in the process. I deemed 2017 my year of “FOCUS” specifically because of this project. I found a quiet, beautiful location in my local community without Internet where I couldn’t be distracted by email notifications, whining kids, or taunting piles of laundry. I’d go there, put in earplugs, and time myself for a three- or four-hour chunk of focused writing time. 3. DOUBLE HOW LONG YOU THINK IT WILL TAKE. Originally, I told Alan I thought I could write his book in nine months. That date came and went. Alan was patient with me, and happy with the chapters he’d seen so far, but I felt behind. To give me some credit, I really didn’t know what I was in for. (And I made lots of mistakes. Once I accidently didn’t save a chapter, and 20 hours of work was gone!) It took 18 months before I sent Alan the final chapter to review. If possible, I highly recommend giving yourself ample time. 4. SET MINI MILESTONES ALONG THE WAY. During this process, the sheer personal effort reminded me of running a race. When I compete in triathlons or half marathons, I bring my whole self to races: physically, mentally, and emotionally. Writing a book was the same. For me, each of the 19 chapters was like passing a mile marker, one mile closer to the finish line. Without chunking it into mini milestones, I would have felt much more overwhelmed. Make sure to have little victories along the way. 5. BELIEVE YOU’RE WORTHY OF WRITING A BOOK—AND JUST START. This is closely tied to mental blocks, but important enough to have its own bullet point. Sure, having a paying client forced me to face my own dreams (and demons). But now that I’ve written one book, I believe I’m worthy of it and hungry for more. It feels SO GOOD to get those words down. I struggled with the thought, “Me? Are you sure you want me to write this?” but working through every page, paragraph, and sentence helped me see those insecurities for what they really are: excuses. The truth is, WHY NOT ME? And the same goes for you: WHY NOT YOU? Just start. Commit to finishing, and have someone important in your life hold you accountable. Want to read Alan’s biography? For right now, it is not available for the public. It was written as a memoir for his family first, with the possibility of publishing in the future. However, I’m currently working on my second book. It is written for YOU, the mom entrepreneur climbing after business dreams. This book “baby” is a labor of love and I can hardly wait to share it with you. (But first, let me double the time I think it will take me!) Sign up here for updates and to get a free chapter in the coming months. Fear. It's a four-letter word. But then again, so is hope. And FEAR doesn't need to stop you from starting or growing your business. No, Mama! 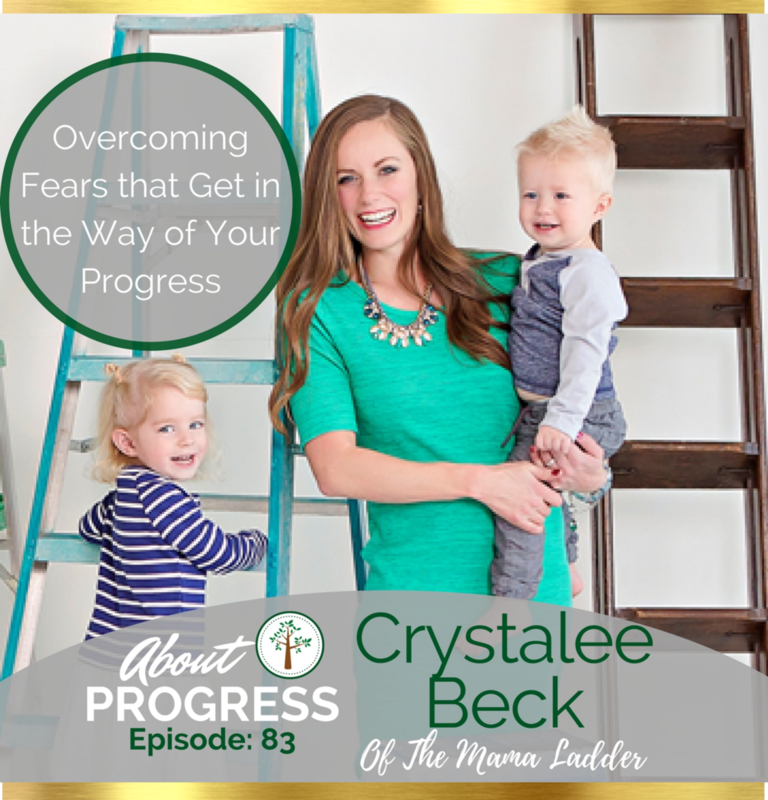 In my recent interview with fabulous Monica Packer of the About Progress podcast, I shared my (ongoing) journey through fear as a mama business owner. What fears are holding YOU back in business? Share below. There's power in telling your truth.